What causes this error, how can I fix it? I had the same issue, but reason was different. In my web.config there was a URL rewrite module rule and I haven’t installed URL rewrite module also. After I install url rewrite module this problem solved. Looks like the user account you're using for your app pool doesn't have rights to the web site directory, so it can't read config from there. Check the app pool and see what user it is configured to run as. Check the directory and see if that user has appropriate rights to it. While you're at it, check the event log and see if IIS logged any more detailed diagnostic information there. Now you will see the Asp.net account on the IIS manager and by default you see IIS account Now you should move you asp.net website from “my document” to another place the IIS have permission to access it (to any partition on your computer) Now browse your website from IIS manager and it should work. We got this error after having to change our domain administrator password. After monkeying with several settings, I eventually found that in the application in below path as it was set to specifically use the domain administrator account rather than pass-through authentication (who knows why). you probably change your NT password. 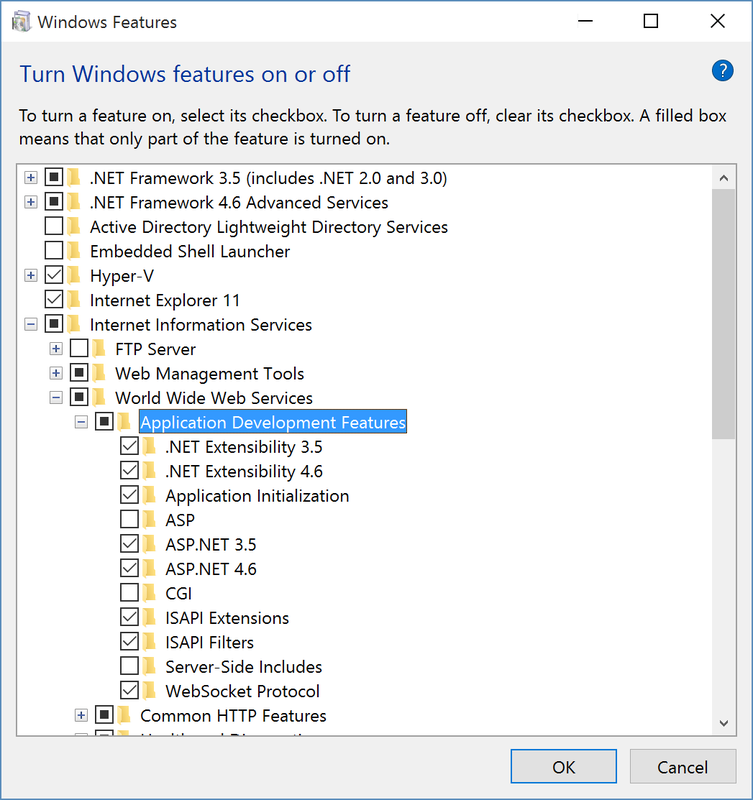 Open IIS -> Right click on your application -> manage application -> advanched Setting -> physical path credentials. In my case, this error appears after changing folder's solution. I solve the problem by goin to my project properties and recreate my virtual directory. Right click on project > Properties > Web > Under Servers section click "Create Virtual Directory"
Got this working alright but not based on suggestions above. My case is that am getting the 500 error running iis7 on a windows 2008 server in a domain. Just added a new user in the domain and basically allow read/execute access to the virtual directory or folder. Ensure that the virtual folder>basic settings> Connect As > Path credentials is set to a user with read/xecute access. You can test settings and both authentication and authorization should work. Cheers! Right now i had this error and resolved it. Your url could match with created virtual directory. I tried to open page with an url (http://localhost/admin/roles) of AdminController and Roles action and got this error. For others out there, I got a similar error message due to trying to run a .Net 4 app in a .Net 2 app pool. Changing the .Net FX version for the app pool fixed it for me. I was having a similar error installing php 5.3.3 with the Error Code 0x80070020 with a direction to a few lines in web.config in my www root directory (not the standard root directory). The solution, while crude, worked perfectly. I simply deleted the web.config file and now everything works. I spent HOURS trying other solutions to no avail. Was having the same error and fixing the credentials in the IIS app pool did not help. I finally resolved the error in IIS by selecting my website under Default Web Site, Advanced Settings->Physical Path Credentials->Specific User, and reentered the credentials for the app pool user, then restarted IIS and the error went away and my website came up successfully. 1 .On Default web site -> basicSettings -> connect as, change it to the right user. For me, I needed to enable Http Activation under the .Net features in "Add/Remove Windows Features"
If it's bigin when you try to acces to joomla administrator panel, Just a username and password problem !! You have just to update a jos_user in your joomla database. In my case joomlauser251 is my DB name. And retry to acces again. In my case, I found a reference to an old domain account password in applicationHost.config under Virtual Directory defaults. so easy find the file "applicationHost.config" in Windows -> System32 ->inetsrv -> config 1. backup "applicationHost.config" to another filename 2. open file "applicationHost.config" clear data and save 3. open browser and call url internal website , finished. If you are using a new, dedicated, user account... It is also worth checking that the password for that account has not expired, as that will also cause this 500.19 permissions issue. As I got the 500.19, I gave IIS_IUSRS full access rights for the mentioned web.config and for the folder of the project. This solved the issue. 2.Go to the section Management and click Feature Delegation. 3.Select the Handler Mappings which is supposed to set as readonly. "Only one <configSections> element allowed. It must be the first child element of the root <configuration> element "
As it says, you must NOT insert your own XML stuff before the <configSections> part of the Web.Config file. After I've inserted my snippet after the end tag of <configSections>, it worked just fine. My website's correct path was not specified in IIS. just delete the corrupted folder. It seem that if the corrupted folder had been created before IIS setup. If you created folder again, it will work correctly. For ASP.NET Core websites, this generic error will also occur if you don't have the HttpPlatformHandler module installed, see this answer for more details. Apparently staticContent is deprecated now? I noticed that in my situation the above edit 1 solution only works temporarily. Once I redeploy the entry gets removed. So, I moved the mimeMap XML into Web.Release.config. Works fine now. I got this error after uninstalling Windows Server Update Services (WSUS) from the computer running IIS. Apparently uninstalling WSUS may break the IIS configuration on the server making other web application installed on the same server unavailable. I found the solution for the problem here. when I change the value to "Portal.html" it worked.